After sailing a near perfect tactical race in extremely difficult conditions, with extremes from a testing 25-knot southerly, with a bumpy seaway through the first night, to a calm in the notoriously rough and windy Bass Strait, Neville Crichton's Alfa Romeo was first to finish in the 2009 Rolex Sydney Hobart Race, with an elapsed time of two days, 9hrs, 2mins, 10secs for the 628nm course. The line honours win, with a Reichel-Pugh designed canting keel 100-footer, was Sydney-based New Zealander Crichton's second in the Rolex Sydney Hobart Race. His previous win, in 2002, was with his first Alfa Romeo maxi, a water-ballasted Reichel/Pugh 90. Alfa, with good speed and crew work, as well as tactics, led from the start, holding off all challenges from her arch-rival Bob Oatley's R/P 100 Wild Oats XI, a very similar design from the same builder, McConaghy Boats in Sydney, launched only a few months apart in 2005, and Mike Slade's (UK) Farr 100, ICAP Leopard. 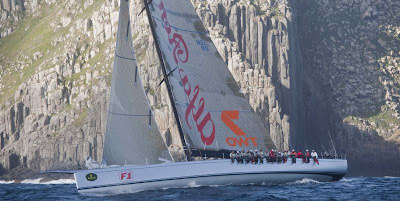 Wild Oats XI won their first line honours battle with Alfa in the 2005 Rolex Sydney Hobart Race by an hour and 16 minutes. 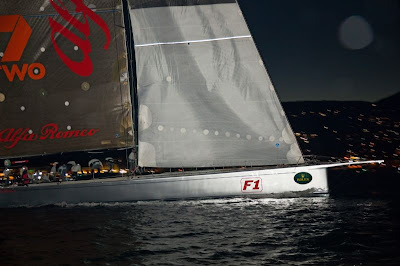 Crichton then took Alfa Romeo to the northern hemisphere for the Mediterranean regattas in 2006 and 2007 where Alfa and Oats swapped line honours wins until Wild Oats XI broke her mast in the 2007 Maxi Yacht Rolex Cup in Porto Cervo and was shipped back to Australia. This year's Rolex Sydney Hobart was their first encounter since in a major offshore race. A crowd of several hundred people crowded the Constitution Wharf marina to watch the finish and cheer Alfa in to the dock. Asked, as Alfa Romeo berthed, how he was feeling, Crichton said: "It's fantastic and the welcome here in Tasmania is unbelievable." He praised his crew, half of them New Zealanders and half Australian: "The 22 guys I have are the best crew in the world. The two days coming down the coast was hard work and it was good; the boys did a helluva job on the boat and it was very, very close racing." Was the lack of wind frustrating? "Oh no, we were very busy the whole race." Did he see the win as sweet revenge for the 2005 defeat by Wild Oats XI? "Every win is a good win. It has taken me four years to come back and do it, so it was even nicer. 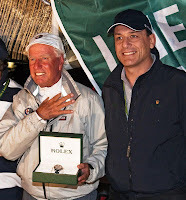 He added, "Winning the Rolex Sydney Hobart is the ultimate in ocean racing."